Many Hyatt ® Hotels have the perfect complement to their Pacific Coast Feather and Down pillows, a luxurious Pacific Coast Feather Co. Down Comforter. This comforter which is another component of the amazing Hyatt ® Grand Bed ® collection is an all season luxury down cluster comforter that is sure to keep you warm and comfortable despite what season of the year it is. 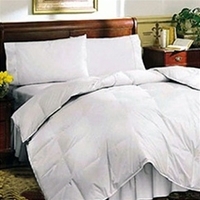 The Pacific Coast Feather Co Down Comforter is 525 fill power which means the right amount of loft and heat retention and the all season fill makes this perfect for almost every climate, which is why the item was sought by many Hyatt ® Hotels, as one can expect having locations all over the world can make bedding choice more difficult! Makeover your bed with a comforter that can only be called grand with the Pacific Coast Feather Down Comforter tonight and find out what many Hyatt ® Hotel guests already know!